Otterbox, a name that many people are probably familiar with. Unless you’ve been hiding underneath a rock, we’re pretty certain you’ve come across an Otterbox case of some kind recently – whether it’s at the store or a friend having one on their device. Generally speaking, Otterbox cases are known for their immense size and ruggedness. However, for those of you owning the HTC One M8, you’ll be intrigued by the more form-fitting nature of Otterbox’s Symmetry Series case. With our particular unit, the oh-so reserved black version of the Symmetry case for the HTC One M8, its design definitely draws up comparisons to the typical cases we’ve seen from Otterbox. 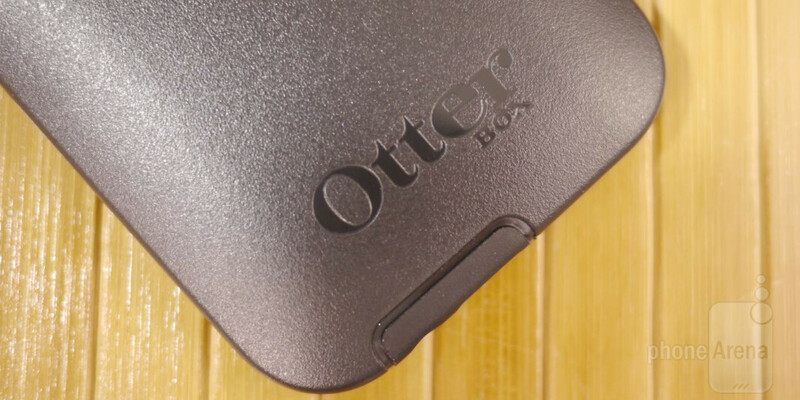 Unlike its usual selection, it’s actually more form-fitting and less bulky – two characteristics we wouldn’t be inclined to find with Otterbox cases in general. Nonetheless, that’s what we’re presented here, so we absolutely like the minimal amount of bulk added to the phone’s size. Whereas our case is rather cookie cutter with its appearance, Otterbox offers it in other contrasting colors that sprinkles a sense of style we wouldn't otherwise find with Otterbox’s cases. Thanks to its dual-material construction, which has that distinct tough plastic feel to it, the phone is adequately protected. Specifically, the synthetic rubber interior with honeycombing coring helps to provide the case with its shock absorption property – ensuring that it’s protected even if it’s dropped. Although it’s not meant to cushion the phone from lengthy heights like the traditional Otterbox rugged style cases many of us are familiar with, say like something more than 4 feet from the ground, it’s strong enough to protect it from anything less than that. Looking at it, the only thing left exposed by the case is the display. However, the raised beveled edge of the case helps to keep the display safe – even if it’s laid flat on a surface, seeing that it’s recessed. Accessing the power button is a cinch too, mainly because the cutout for it extends all the way to the back of the phone. Finally, the cutout for the 3.5mm headset jack is wide enough to accommodate fatter cables. Sporting a retail price of $39.95, it’s no doubt pretty pricey taking into account its reserved tone. Sure, there’s still good protection here with the Symmetry Series case for the HTC One M8, but like we said already, it’s not at the same level to what we’re used to seeing from Otterbox. Regardless of that, we do appreciate how it’s been toned down – both in price and its overall size. If you’re a longtime fan of Otterbox’s cases, but want something more compact and easier to handle, this one will suffice. "I love premium aluminium materials." I own it and like it. Mine is glacier color.